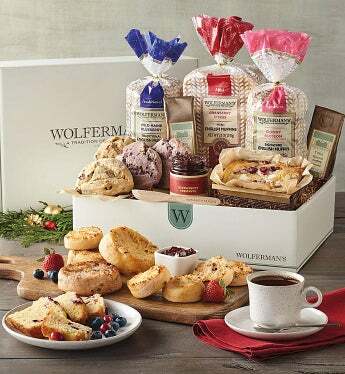 Year-in and year-out, the Berry Breakfast Box is one of Wolferman's® most popular gift selections. Customers especially enjoy the sweet and tart flavors in these extra delicious English muffins, provided here in all three sizes. An abundance of fruit in the muffins and fine pastries makes each bite of this gourmet breakfast a true delight. You'll quickly find that these decadent treats are great for snacks and desserts, too. Total net weight: 3 lb 10oz. Year-in and year-out, the Berry Breakfst Box is one of Wolferman's® most popular gift selections. Customers especially enjoy the sweet and tart flavors in these extra delicious English muffins, provided here in all three sizes. An abundance of fruit in the muffins and fine pastries makes each bite of this gourmet breakfast a true delight. You'll quickly find that these decadent treats are great for snacks and desserts, too.